The Park is open 365 days a year and Park Wardens operate in the Park most days. Cars can enter the Park from the entrance on the Carlton Road, Harrold. The main car park is on the right and is free; visitors are encouraged to leave a donation in the boxes provided. The money collected is all used by the Friends of the Park to improve the environment for visitors and wildlife. There are reserved parking spaces for the disabled to the left of the main car park and overlooking the lake. An overspill car park operates when the main car park is full. However, this car park is locked after 5:00pm each day. Pedestrians can enter the Park from a number of entrances, the main ones being at the Harrold and Odell ends of the Park. All areas of the Park are open to walkers. 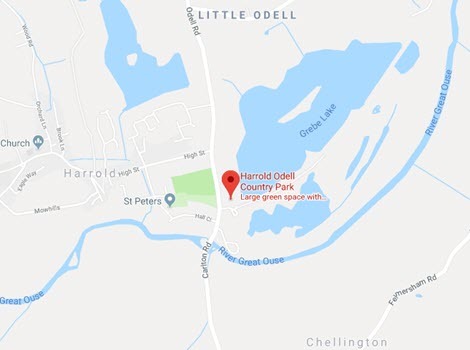 Cyclists are welcome to visit the Park but cycling is restricted to the Harrold to Odell bridleway leading from the main entrance. The footpath around the main lake is limited to pedestrians only. Bike racks are provided on the lake side of the Visitors' Centre. Reserved spaces for the disabled are located to the left of the main car park, facing Grebe Lake. A ramp provides wheelchair access to the Visitors' Centre on the Carlton Road side of the Centre. This also provides access to toilet facilities for the disabled. The main pathway through the Park and around Grebe Lake has a hard but unpaved surface that is suitable for wheelchairs and pushchairs for most of the year. However, parts of the path can be wet in winter and after heavy rain. All kissing gates in the Park have radar key access as does the Visitors' Centre toilet. Both the bird hides in the Park are accessible to wheelchair users.